Featuring sparkling details and modern charm, the Paris Hilton Round 2 White Dial Watch features a circular, black ion-plated, stainless steel bezel that is inset with two rows of crystals. The crystals surround a white dial with black, Arabic-numeral hour indexes at the even hours, black dotted hour indexes at the odd hours, and black hour and minute hands. The mineral crystal window provides scratch resistance, while a stainless steel case offers strength. Made from durable silicone, the slender, black bracelet offers a classic look constructed with contemporary materials. 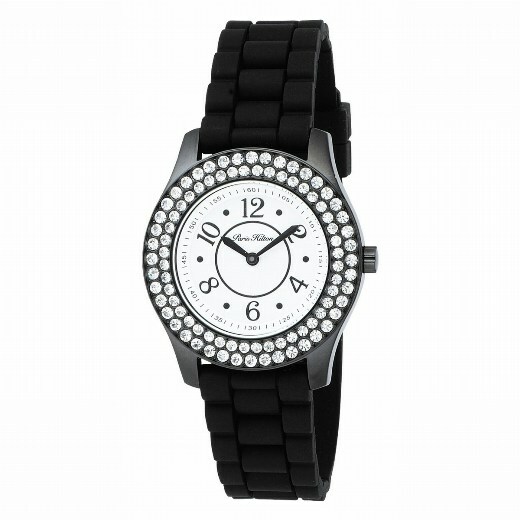 This Paris Hilton watch is water resistant to 99 feet and boasts high-quality quartz movement.